In some Japanese cities it is not unusual to see a small, seventeenth-century, tile-roofed Buddhist temple nestled between tall, modern glass office buildings. Even in the more traditional countryside, the contrast between old and new can be stark. While one family sits at a contemporary Western-style dinner table eating juicy steak, their more typical neighbors are seated on the floor eating rice and miso soup with chopsticks. However, when it comes to Japanese pickled plums, or umeboshi (literally, dried plum), everyone seems to agree that there is no modern substitute for its zesty palate-cleansing flavor and fast-acting medicinal effects. 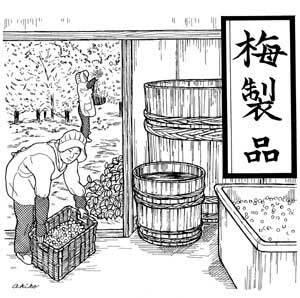 Even today, some traditional Japanese people begin the day with one or two pickled plums and a mug of tea. British author and Japanese food authority Robbie Swinnerton compares umeboshi's taste to the culinary equivalent of a cold shower. Swinnerton writes, "The abrupt, searingly tart, tangy, salty taste jolts the eyes open, shakes the stomach awake, sandpapers off any staleness from the taste buds, and gets the day off to an unforgettable start."